Aside from providing some good laughs for me and the husband, a couple of Noah St. John's theories of success, have stuck with me, like rice grains wedged in the crevass between the burner and the stovetop. In a previous post I talked about his "loving mirrors," about how if you're trying out a new idea, having a trustworthy friend there to tell you it's a good idea is better than psyching yourself up in a vacuum. Having someone you believe in believe in you can be just the nudge you need to get yourself unstuck. Pardon me, I drifted off into such a fabulous reverie. Anyhoo, INSTEAD of visualizing your moment of greatest glory, Noah St. John suggests imagining your average perfect day. Pardon me, I drifted off again. And I know neither of those hosts has a talk show anymore, but it's my fantasy. And I thought, hmmm, that I can do. Imagining The Average Perfect Day appeals to my pragmatic side--yes, I do have one. It sidesteps hubris and hyperbole. It also daintily steps over Self Doubt that likes to settle down at my feet but is always ready to race to the window and bark at any stray positive thought I might entertain. And THEN I thought, you know what? I'm already living my average perfect day. I have succeeded, my dozens of readers. Now if only someone would PAY me to do this. And some of us do get paid, but don't have many perfect days. I guess that is what people mean when they say, "You can't have it all." I still wish you could! Well, I think you can have it all, just not all at once. And now that I'm enjoying myself, it's time to figure out how to earn money. Which will probably mean a little less enjoying of my days. hope this is gorgeous. thank you. 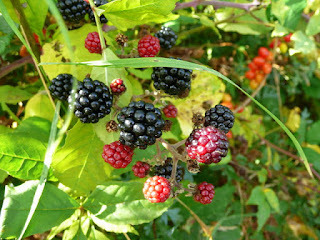 Hey, those look like the blackberries we had in abundance in our back yard at our old house! The house we live in now doesn't have a blackberry bush, so we must risk life and limb in the summer when the hubby pulls over at the sight of some random bush burdened with ripening fruit. Worth it. Your average perfect day sounds like mine, except for the empty nest we have, which makes it even more perfect for me. And for the hubby, since he doesn't have to share my focus when he drags his employed self home and I must make up for the fact that I have average perfect days every day at his expense. You and I also have the same pet, Self Doubt. Your stray positive thoughts are much more interesting to bark at. My Self Doubt must be bored. Repetitive insecurities are all she gets. And I'm sure someone among your dozens of readers (yay! dozens, not merely tens, did I call it or did I call it) does in fact picture an average perfect day IN AN OFFICE. I wish we had blackberries in our backyard! Maybe we'll plant one. I would love to hear about someone's average perfect day in an office. I myself got very depressed when I had to work 9-5 in an office. But sometimes, when I think about financial issues, a 9-5 job of any kind seems like an excellent idea! David, I've been working on it! Frustration, despair, and pessimism have also been my companions-but less lately. It is definitely true that what you think about shapes you. (Buddhism).